Barely out of our End Of Year albums list, Pharmakon has recently shared a short film with the same title as her latest album, Bestial Burden. Directed by Margaret Chardiet (Pharmakon) herself, together with Nina Hartmann, in the film Margaret gets her internal organs brutally torn apart by several random hands, before it cuts to some dark and intense footage of a Pharmakon live show and finishes with a few people burning the organs they grabbed off her earlier in a fire. According to Margaret Chardiet: The actions aim to break through barriers of live and recorded performance, into the immediate reality. 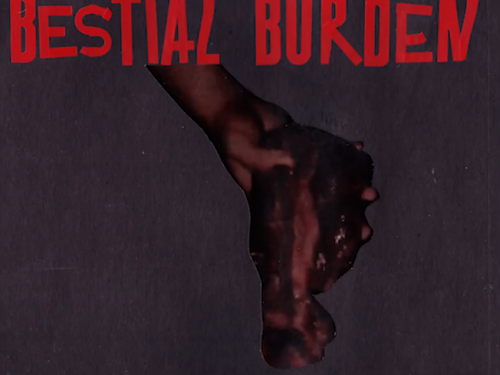 The video extends the music and aesthetics of the album into their visceral forms, and serves as the bodily/visual pairing to coincide with the record, Bestial Burden. “I call for actors burning at the stakes, laughing at the flames.” - Antonin Artaud, The Theater and Its Double.